The following is a concept design for a long endurance- low cost alternative to the Ecosynth octo design. The design is based off of Steve Westerfeld's (of DIYDrones) high performance hexacopter. It caught my eye when Steve posted his (winning) entry in the T3 Multirotor challenge. Steve Westerfeld's hexa. It has an all-up-weight of 2.8kg,1050 RCTimer motors with 15" carbon fiber propellers, and two 6000mAh lipo batteries in parallel. It can fly for 42 minutes. Based on Steve's design (I contacted him for some advice on replicating his results), I designed a hexacopter with Mikrokopter frame (for lightness), Arducopter electronics (for ease of use, since our lab is already familiar with them), and the pancake motors plus carbon fiber props that Steve used (for efficiency). I calculated the weight of this hypothetical copter (camera+dog tracker payload included), and included two 8000 mAh lipos. The all-up-weight was just under 2.8kg- mainly due to the lighter frame and landing gear freeing up extra weight with which to use heavier batteries. Due to the near equal weight but increased battery capacity, I predict that the hypothetical hexa could fly for 45 minutes or longer. The only other significant factor besides all-up-weight and prop/motor choice (which I kept the same) is the choice of ESC's. I chose Arducopter ESC's over Steve's specialty ESC's; I don't believe that the difference in efficiency of those ESC's would be significant. Compared to the Ecosynth Octo, our current mainstay for large area mapping, 45 minutes is a major improvement over the octo's 30 minutes. 2.8kg is also safer than the octo's 4kg weight. And most especially- the cost. The current Ecosynth octocopter costs nearly $2,500. As I've detailed in the following budget, the long range hexa costs under $900. The Electronics for the long endurance hexa. Shown above is an ESC, the power distribution board, two electronics plates, the APM 2.5 + GPS + power module, and the 3DR telemetry set. The frame for the long endurance hexa (not shown to scale. Arms are longer, landing gear is bigger.) Depicted above are the center plate, the red and back arms, and the landing gear. 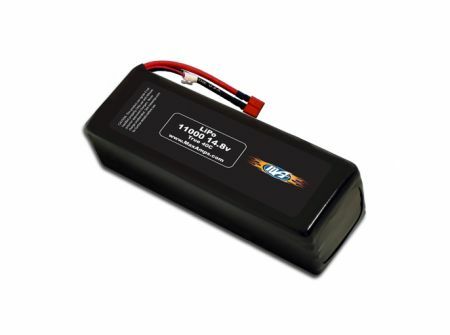 The 8000mAh 14.8V lipo battery. The frame uses the long arms intended for the Mikrokopter Okto XL, but places them in a hexa configuration. This is what allows enough room for 15" props. The electronics will be mounted on two tiers- one for the power distro board and one for the APM+GPS+RC Reciever+Telemetry, like the other recent Ecosynth aircraft. A tupperware dome will cover the electronics as usual. One red led on the front arm and two LEDs on the back arms will help identify which direction the copter is facing while in flight. Three landing gear legs would be mounted: one on the back leg and two on the front legs. The camera mount would be the same system as the octo. Because of the high ground clearance afforded by the landing gear, the propellers and motors will be mounted facing downwards so as to extend the life of the motors and marginally increase motor efficiency. In brief: the long endurance hexacopter is a low cost high performance alternative to the current Ecosynth octocopter. I saw the work you guys have done for long endurance multi-rotors. The octocopter results were uploaded to diydrones, but I also noticed this result. Have you flown with this craft and does it fulfill the expectations for endurance, stability, payload, etc? Sorry Gerard, this is just a concept design. We have not built it and we don't have any immediate plans to do so. Ok, understood. I joined because I've been asked to come up with a proposal for an ecological monitoring project in Brazil. They want 30mins flight times on very tight budgets in this first round. So this seems like a very good fit in this situation, unless in hindsight you wouldn't recommend building this. If the proposal gets accepted, I'm willing to give it a go. Any last-minute hints are welcome. In theory, yes this copter should be able to fly over 30 minutes as long as you keep the payload small like the ones we use (our camera setup is about 300g). Of course in practice I can't promise anything, since I haven't built this. I don't know if you are experienced with hobbyist grade multicopters, but this one is not at a beginner level. I would be comfortable building this because I have about a year and a half of experience, but if you are new I would definitely recommend getting a training copter first. Does Mikrocopter offer a lighter frame? Mikrocopter is at mikrokopter.us or mikrocontroller.com. There are lighter frames possible, but those have shorter arms. Obviously this has consequences, because the props need to be separated, so you must use a certain length. In this case it's 15" props with 460mm arms. Octo's further complicate this, so I wouldn't go for those. Octos are built for heavy lifting of a lot of weight, but provide no other benefit besides that. A quad is built for hovering very long times with minimal payload, but can't lift much weight. So the hexa is a nice creature inbetween for not too much weight (up to 500g). It can lift a bit more, but then flight time is going to suffer. Stephen, I just ordered the electronics to commence this build for my own company, so I'll let people know on this page what the results are. It will take three weeks to complete though (shipment). I made some minor changes in the end. I first entered my figures into xcoptercalc to see if the numbers made sense. Your setup indeed comes out at around 42minutes, so I reckon that the estimate of that tool isn't too far off. I substituted the hilander legs for a regular 15cm flexlander xl (slightly lighter). For this build all the little grams add up. For the rest I didn't see other opportunities to reduce frame weight, except using carbon rods. Every gram you scrape off from the arms is multiplied by 6¸ thus make huge differences in the end. The biggest difference is created by using batteries with very high energy density (but they're way more expensive). 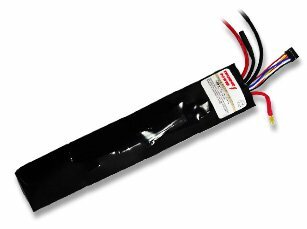 The maxamps 11000mAh with weight of 865g delivers 12.71mAh/g, whereas most hobbyking batteries are below 10mAh/g. The end result is a 2kg craft which hovers for 51mins without payload, 44mins with 200g payload and 37mins with 500g payload. Those numbers drop rapidly. The most efficient point is where batteries equal about half of the AUW. In this case adding the same battery again changes the numbers to 63 mins, 56 mins and 49 mins, increasing the AUW to 2.8kg without payload. 1 The other battery increased the flight time a bit (although it's wasted heavily). 2 A maximum loading of batteries dampens the heavy reduction in flight time due to the payload. Adding batteries of lesser energy density have a negligible effect, however they do increase flight times if payload increases (2). The total cost for this setup on my end is $1500 without spares and rx. Someone getting into this would need to add radio, rx, spares, ground station equipment and construction equipment to the budget. There are other props in the market which hint at even higher flying times, but they require more torque and I reckon the motor is already in a tricky area. that's one of the first things I'll check, verify that the motor can continue to rotate on these large props. I don't want to risk this too much. The actual flying time is likely less than the hover time, but some people have hinted how helis like to make some forward progress to improve their efficiency. Another part of research would be to find out if there's a sweet spot in forward velocity that can further increase the time in the air for mapping applications. One added benefit of these props is that the craft seems to 'sail' through the air on them, as if they're half wings and half multirotor. I'm wondering if some added forward velocity (angle!) could thus improve lift efficiency further. Not that it's necessary. I'm already more than happy if I only get 30mins out of this. I was sent your guys way via Ralph Dubayah, my old professor. We are going to attempt to build this bad boy. I was trying to track down sites/parts etc. We have a few older quads but want to upgrade. I'm trying to track down the parts you listed. A few are difficult to figure out. Is it possible I can can email/call to ask about it. Unfortunately, time is short as we have to spent the university's money by end of the week. See the front page, there are two articles showing a build, test flight and discussion of this concept design. The frame, for the majority, is bought from mikrokopter.de (see link "shop"). Affordable batteries go through hobbyking, I bought a maxamps one in my case. Hobbyking also sells radios (turnigy9x), which can be converted into ER9X ones (see internet). Props and motors are from rctimer. See discussion in the other threads to learn about issues, I think we're homing it down to motor misalignment. APM, GPS, compass, telemetry, ESC's and top plates comes from 3drobotics.com (3DR). I always buy a motor, esc, arm and stuff extra so you can deal with crashes or equipment arriving dead on arrival or incorrect drill holes. That really saves time and money if it does happen. For the frame you also need plastic screws, nuts, vibration dampeners. See their wiki for more info on what's required to build their lipo holder and so on. The best thing to do is put an excel file together listing everything you intend to buy and go over that multiple times to see if you forgot anything (include link to product). For the frame, don't forget you need metal screws and stuff to put this together. Depending on what batteries you use and the plugs they have, you may want to buy a pack of battery connectors so you can change everything to what's required. I prefer XT-60, which seems to have a better grip and connection than deans. You also need the right diameter plug to connect esc with motor, as the diameters are not equal. I soldered them together (must be equal length!) and extended the power wires from the esc instead (14 AWG wire). So if you do that instead, you also need some 14 AWG red/black wire. A meter should do for six. Thanks for the help, I will let you know how it goes ordering equipment tomorrow! allright. Want me to have a look at the ordering list? I'm not going to be held responsible, but if I spot things you may be missing, it does save a lot on shipping and waiting times. Any updates on your build of the hexacopter? I am going to modify the order list for the octo and go ahead and order the parts. Would you mind talking a look? I need to replace one of the rctimer motors on the hexa since two days ago. It had 60 minutes of flight more or less, but the motor doesn't run well and seems to tip over. It was the same motor that with the larger props had issues, so probably it doesn't handle the load consistently. Thorsten reported similar issues with these rctimer motors, so I think I should advise against getting those. There are similar complaints on quality on other forums or at least "hit&miss" experiences where a certain percentage is simply not functional. I'm still awaiting newer motors from hobbyking to arrive, so I cannot advise you which motors to get. My new set will be Graupner 14x8 props with NX4006 530kV motors instead. That means slightly less endurance, but I expect really good stability, good wind penetration and more throttle response. Due to the " lipo crisis " from hobbyking, there are plenty delays with shipments from there. So, rctimer motors don't look promising for future builds and I advise against getting those. What motors to get instead is TBD awaiting shipment to arrive.